Our prescribed fire contractor burns Phragmites at Gallagher Creek Park, spring 2015. Many ecosystems are vitally linked to fire. Historically, fire was a common feature of the Midwest landscape. Prairies, wetlands, and woodlands burned with some frequency. As people more densely settled our area, fires were extinguished before they could spread. These actions disrupted the natural disturbance patterns. By reintroducing fire we are reintroducing a natural process. Intact prairies, wetlands, and woodlands are rich with a diversity of plant and animal life. However, with the cessation of fire we have allowed many fire-intolerant, non-native plant species to out-compete the native, fire-adapted plants. With heavy competition from non-native plants, our natural areas have a tendency to become thickets of shrubs or weeds with very little diversity. Fire controls the invasion of undesirable plants by stimulating native fire-adapted plants to spread. It simultaneously kills many woody and non-native plants that would otherwise take over these sites. Fire enriches the soil and lengthens the growing season by raising the ground temperature as well. Fire allows diverse, native plant and animal communities to thrive in our natural areas. Regular burning maintains fire-dependent plant communities, such as the prairie remnant and butterfly milkweed shown here. Prior to a controlled burn each prospective site is assessed completely. We prepare detailed maps showing areas targeted for burns, where firebreaks will be located, and neighborhoods in which people might see or smell smoke. A burn plan is prepared for the area providing detailed information on the specific ecological benefits of burning, ideal weather conditions, ignition pattern, number of people and equipment needed, and emergency phone numbers. Such a plan is called a ‘burn prescription’. City and township fire marshals review the prescriptions and approve them before burns are conducted. For each burn we create a detailed map showing the boundaries of the burn unit. This map is included in the burn plan. After the plan is approved we go to work checking the burn breaks, testing our equipment, and training the burn crew. In order to fill a burn prescription, we must wait. Weather conditions – temperature, wind direction and strength, humidity, barometric pressure, and ground moisture – all must be within the range specified in the prescription before we proceed. Since the weather and fuel conditions can change quickly, we typically won’t decide to do a burn until the night before or morning of the burn. Tools like the hourly weather graphs on weather.gov help us decide if the conditions will be right for a burn. Before each burn the crew meets for a briefing to review the plan, check equipment, discuss safety, and review emergency procedures. 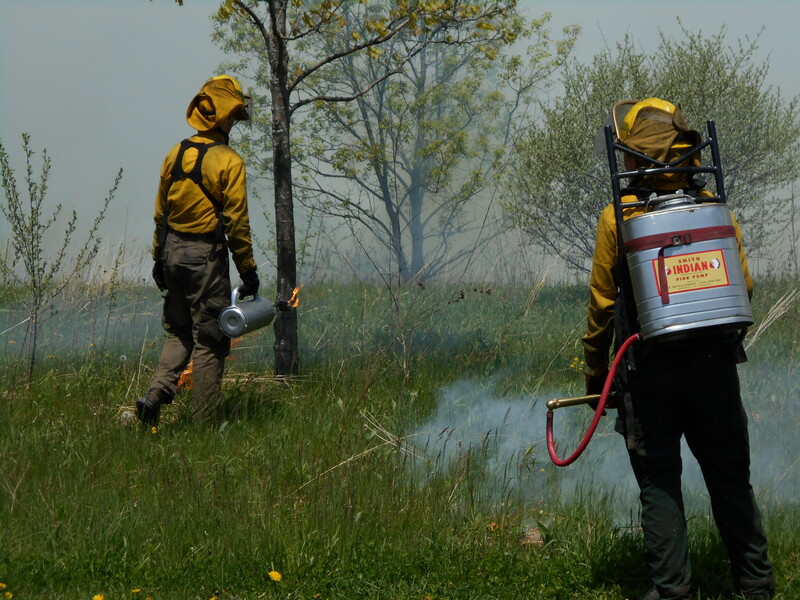 We establish good burn break – trails, roads, streams, lawns – and use slow backing fire to build a wide “black line” around the perimeter of the burn unit. The ignition crew communicates closely with the holding crew to make sure the fire does not burn in areas outside the burn unit. The burn plan specifies the special equipment needed to safely complete the burn. This often includes an ATV with additional water. After burning the available fuel, the fire slowly extinguishes itself. We then walk the entire unit to make sure there is nothing is smouldering or smoking. Photo courtesy of Mike & Joan Kent. Well-equipped, fully trained staff and volunteers conduct the burn. A prescribed burn will produce some air pollutants, but more significantly, the fire restores the fire-adapted ecosystem, which in turn has a greater capacity to remove CO2 from the atmosphere and produce oxygen. Emissions from burns are significantly less than those produced from mowing a comparably sized site. During the burn, most animals find cover by retreating to burrows, flying away or moving to surrounding areas. Animal habitat is generally improved as a result of fire – stimulating a diverse, healthy, natural community. The local fire department is notified at the beginning and end of each burn, and a cellular phone and several two-way radios are carried by staff conducting a burn. If anything unexpected does occur, staff and outside resources are notified and respond immediately. Additionally, an ample number of portable water tanks and a water truck are present at a burn site. An area to be burned is also surrounded by a non-combustible strip of ground, called a “burn break,” which contains the fire. How quickly will an area recover? Burned areas re-green very rapidly if burned in the spring, but won’t green up until the following spring if burned in the late fall or winter. Solar heat absorbed by the blackened surface warms soil quickly. Plants respond by vigorously sprouting and sending up shoots. It is amazing to visit these areas periodically after a burn and witness the fast rate of new plant growth and the appearance of long dormant plants not in evidence prior to the burn. 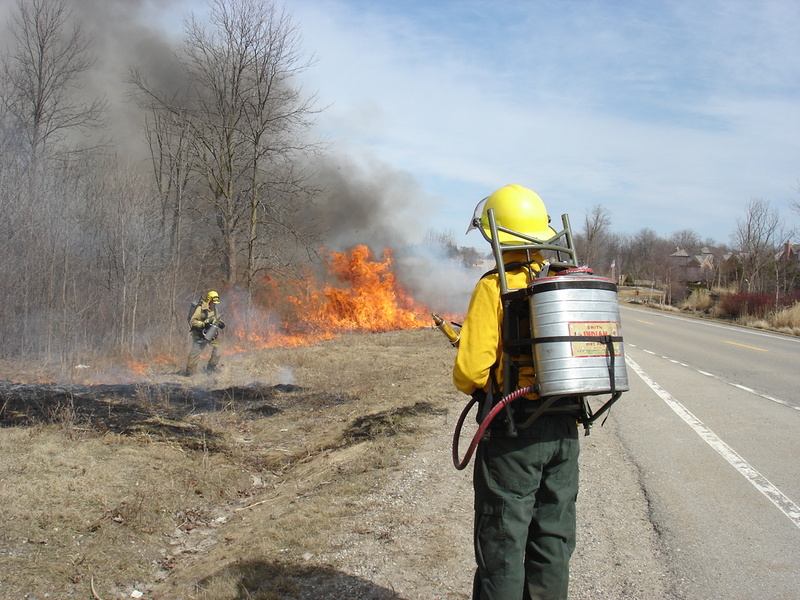 If you’d like to volunteer on our prescribed burn crew, contact Ben VanderWeide to learn more – bvanderweide@oaklandtownship.org.